Saw my first groundhog of the year today. The property around my workplace is an old apple orchard and groundhogs have the run of the place during the warm weather, but until today, they were hibernating. I saw only one today, but I expect his friends and family will be up and around in another day or two. The photo above was taken with my new Canon PowerShot SD940 IS. 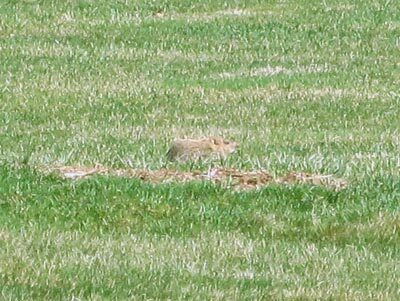 I was about 100 feet away from the groundhog when I took the photo with the camera's built-in zoom lens set to maximum zoom. Not bad!